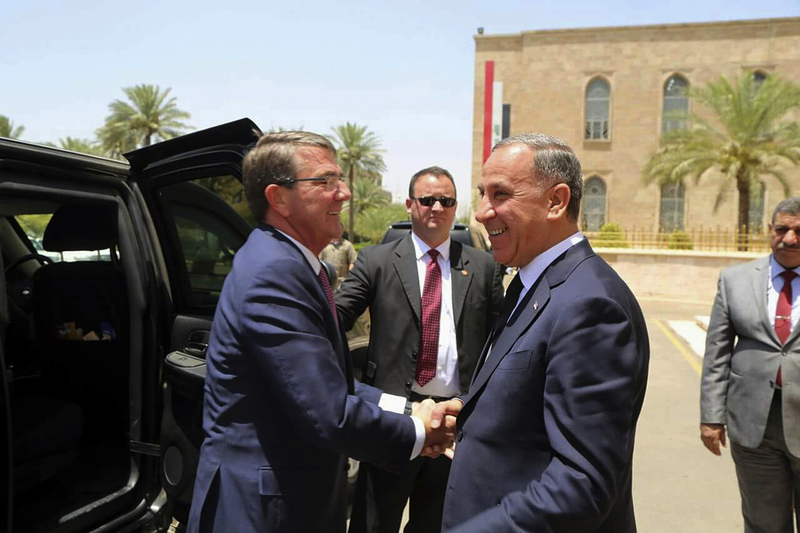 Baghdad -- The United States will send 560 more troops to Iraq to help establish a newly retaken air base as a staging hub for the long-awaited battle to recapture Mosul from Islamic State militants, Defense Secretary Ash Carter said Monday on an unannounced visit to the country. Most of the new troops will be devoted to the build-up of the Qayara air base, about 40 miles south of Mosul, and include engineers, logistics personnel and other forces, Carter said in Baghdad. They will help Iraqi security forces planning to encircle and eventually retake the key city. "These additional U.S. forces will bring unique capabilities to the campaign and provide critical enabler support to Iraqi forces at a key moment in the fight," Carter said, according to prepared remarks. He revealed President Barack Obama's decision during a talk to troops at the airport in Baghdad. The increase brings the total U.S. force authorization in Iraq to 4,647, and comes just three months after Obama's last announcement of additional troops. Carter told reporters earlier that U.S. advisers are prepared to accompany Iraqi battalions if needed, as those units begin the siege of the key northern city. It's not clear when exactly that will happen. U.S. officials said a team of American troops went into Qayara for a quick site assessment Sunday and left. One potential job is helping Iraqi troops use highly technical bridging capabilities to get across the river into Mosul. Carter called this weekend's recapture of Qayara a key strategic victory. Speaking to reporters before he arrived in Baghdad, he said the air base will be one a hub from which "Iraqi Security Forces, accompanied and advised by us as needed, will complete the southern-most envelopment of Mosul. That's its strategic role, and that's its strategic importance." He likened the air base to how forces used the eastern city of Makhmour. There, U.S. troops set up a fire base for artillery to support advancing Iraqi units. Marine Staff Sgt. Louis F. Cardin was killed at the fire base in March in an IS rocket attack. Iraqi forces retook the air base from the Islamic State group on Saturday. Prime Minister Haider al-Abadi hailed the success as a key step toward Mosul, Iraq's second largest city. Residents there should "get ready for the liberation of their areas," al-Abadi said. U.S. officials said American advisers are already working at brigade level with Iraqi special operations forces, but they have not yet accompanied them on operations. They weren't authorized to discuss the matter publicly and demanded anonymity. Obama in April allowed U.S. troops to assist Iraqi forces at brigade and battalion levels, where they could be at greater risk closer to the battle. They would still be behind front lines. They previously had been limited to advising at headquarters and division levels, further from the battle. Carter is expected to meet al-Abadi and minister of defense Khalid al-Obeidi, and Lt. Gen. Sean MacFarland, the top U.S. military commander for the Islamic State fight. The main topic, he said, will be the next steps in the military campaign, with a particular focus on Mosul. IS captured Mosul in the summer of 2014. It has used the city as a main headquarters since. In addition to Qayara, Iraqi government troops recently have retaken Ramadi, Fallujah and a number of towns along the route to Mosul. But Islamic State militants still control large swaths of the country and continue to launch deadly attacks, including a massive suicide bombing last week at Baghdad's bustling commercial area of Karada. As many as 186 were killed.